If you’re one of the lucky people whose company provides a corporate commuter shuttle for your ride to work, you know that it’s an awesome way to boost your productivity and reduce your stress of driving through our notorious San Francisco traffic. However, you’ve probably also already discovered that it’s not always a given that you’ll be productive on your corporate commuter shuttle ride. Here are are some tips from our charter bus company on how you can maximize that time of the day to make sure that you arrive at work ready to hit the ground running. A pair of headphones can help you to escape into your own world and shut out the activity around you. Not only do they give you the chance to listen to your music at an unprecedented level of quality, they also tell the people around you, “I don’t want to be bothered or spoken to.” This can help you to get into the zone and focus while you’re riding to work, and you might just find that the ride seems shorter than you would have thought possible, simply because you weren’t being interrupted. Plus, if you’re going to need to field important calls, simply plug the headphone jack into your smartphone and you’ll be able to talk on the phone without removing your headphones. 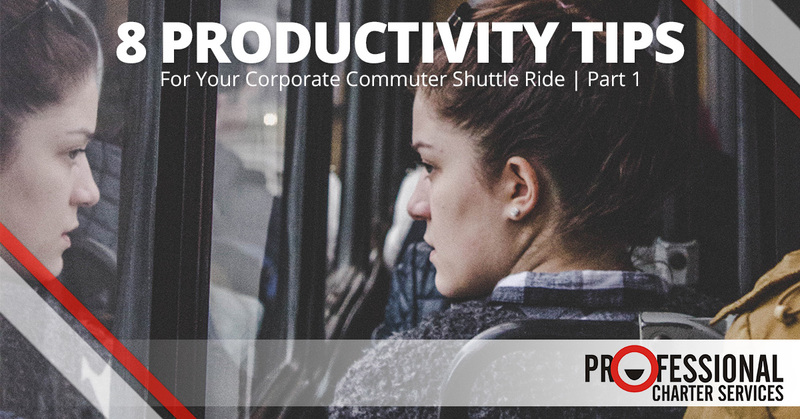 There are probably a few types of tasks you can easily complete on your shuttle ride to and from work and a few types of tasks that you can really only do well at the office. Plan your commute time with just as much focus and intentionality as you would plan your workday, putting into your commute time the tasks that make the most sense to put there. You’ll be amazed at how well you can charge through tasks if you have a solid plan in place. 3. Give yourself work that’s already in progress. If you’re like many people, the biggest difficulty in being productive is often just getting started. You’ll be amazed how many times this simple hack can jumpstart your productivity and lend wings to your feet: In the evening before you leave work, while you’re on a roll, start a task or a project and then stop just after you’ve gotten started. Then save that piece of work for your morning commute the next day. You’ll have a fresh, clean, barely-started document in place, and you’ll be able to jump in with both feet and charge forward. This surge of momentum can sometimes carry you through the whole day, as you feel delighted and amazed at how quickly you got going in the morning. 4. Set achievable productivity goals. You won’t be able to hit your productivity goals if you don’t know what they are. A vague sense of “I think I was productive today” is far less effective than the very concrete sense of accomplishment and winning that you’ll experience if you set a goal and achieve it. “I won today because I hit the metrics that I was shooting for.” Setting achievable goals for yourself on your commute to and from work is a delicate art that requires you to be realistic yet ambitious at the same time. If you’re constantly setting goals that are too high, you’ll give up on ever hitting them and begin to wonder why you should bother setting goals at all. If you’re constantly setting goals that are too low, you’ll risk falling short of the level of accomplishment that you could have had. Set goals that are firmly rooted in what’s sustainable, while keeping in mind the reason why you want to drive for those goals. Stay tuned for our next blog post, when we’ll cover four more productivity tips for your morning commute. In the meantime, if your company doesn’t yet offer corporate commuter shuttles to employees, why not suggest it as an employee perk that will also boost productivity and employee morale? It’s affordable and it’s available throughout San Francisco from Professional Charter Services. You could be riding to work on a climate-controlled, wifi-equipped shuttle bus instead of fighting the traffic. Contact Professional Charter Services today to learn more about our commuter shuttle program.